We are Offering wide range of you a complete choice of products which include Hot Plates such as Rectangular Hot Plate and Round Hot Plate. 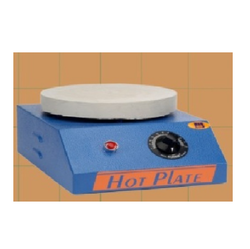 Round Hot Plates are fitted with a cast iron platform with energy regulator, digital temperature control module and a working voltage. Temperature is controlled by a three position rotary switch. We manufacture these by using high quality cast iron and stainless steel. These products are widely used in various industries and sectors for different applications. These are available in various sizes & designs at most competitive prices to fulfil their exact requirements and demands. This ensures air insulation between plate and base unit.